“New Year’s resolutions should be called res-ILLUSIONS”, my friend quipped on January 1st; “people delude themselves that they will actually do them.” Unfortunately, the research shows he is mostly right — on average, only 19% of people keep their New Year’s resolutions after 2 years! So why is long-term change so hard? As a psychologist, the #1 mistake I see people make with resolutions is that they focus more on goal-setting rather than than goal-iteration. While it’s useful to set S.M.A.R.T. goals (Specific, Measurable, Achievable, Relevant, Time-Bound), the best intentions are usually never followed up with actual behavior change in the long run. I also know this first hand — I read dozens of great posts, articles, and books on leadership, entrepreneurship, and technology every year. They are written by brilliant people with evidence-based strategies for personal and professional development. However, I can tell you that until I used the system I am about to share, almost none of it actually made a tangible and sustainable effect on my life. So here is the “resolution solution” that transformed futile failure into sustainable success. 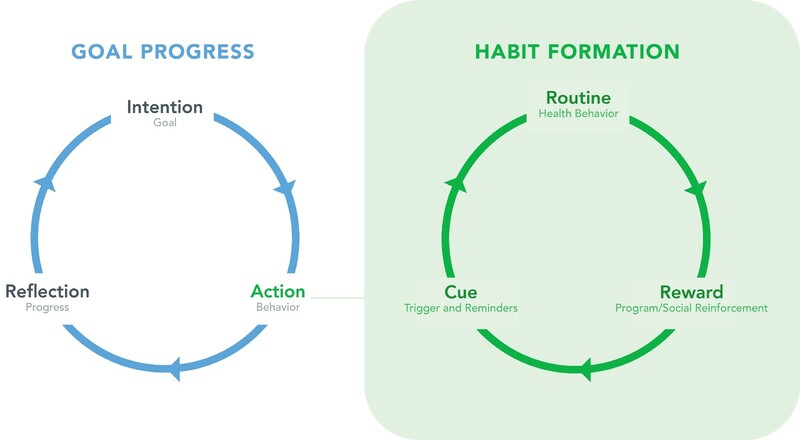 Behavior change ultimately boils down to two positive feedback loops: the Goal Progress Loop and the Habit Formation Loop. In the Goal Progress Loop, you start with an intention: setting a S.M.A.R.T. goal that you want to achieve. For example: I will lift weights, Mon-Fri, from 8–9AM, at the gym next to my work). That is followed by an attempt to take action within the designated timespan: I was successful 4/5 days last week, except Friday. To make it more likely to complete the action, we use the Habit Formation Loop. In order for an action to become a routine habit, it needs a cue to remind you to start the habit (e.g. setting an alarm or passing by the gym on the way to work). Furthermore, routines are only sustained long-term if they provide sufficient rewards (e.g. feeling better about how I look/feel, or the social benefit of seeing my friends at the gym). Now completing the Goal Progress Loop: after attempting the action, engage in reflection to understand why you were (or were not) successful, and then adjust your goal and strategies accordingly. For example, I may reflect that going out on Thursday night led to sleep deprivation and not waking up early enough to make my Friday morning workout. Next time, if I choose to go out on Thursday night, I will adjust my Friday workout to the early evening. 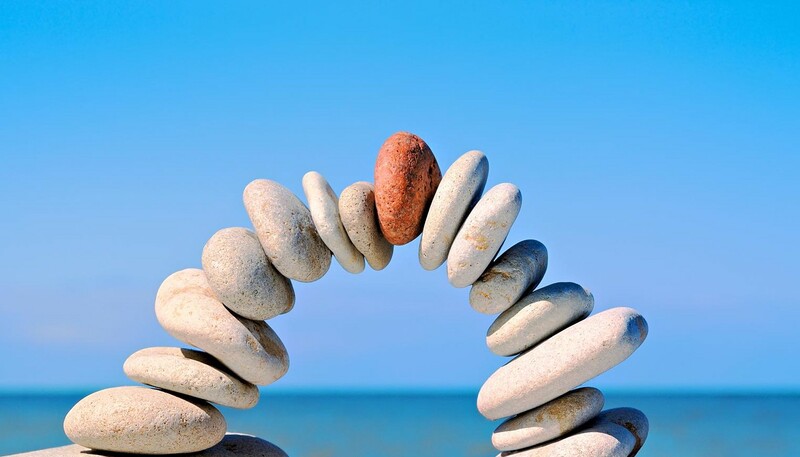 In architecture, a keystone is a wedge-shaped stone piece at the top of an arch that locks all the other stones into position, allowing the arch to bear weight even without any mortar to bind it. Similarly, the Keystone Habit is the foundational habit that allows all other habits in your life to be sustained. While health behaviors (e.g. sleep, nutrition, exercise, mood management, and social connection) are essential to health and happiness, practicing the Keystone Habit is critical to making sure you are actually maintaining and improving these health behaviors over time. Thus, the Keystone Habit has one of the highest returns on your time investment of virtually any behavior. - Goal Analysis: What factors specifically contributed to my doing well or not? - Goal Strategy: What (un)successful strategies should I (dis)continue from last time? What new strategies should I experiment with to increase my likelihood of success next time? - Goal Adjustment: What are my new goals to work on until the next Keystone Habit? Reflecting on what did or did not work and readjusting your goals is simple and makes intuitive sense. But there is an old saying that “insanity is doing the same thing over and over again and expecting different results,” and that is how the majority of people operate. As the captain of the ship of your life, you need to periodically check whether you are going in the right direction and readjust every once in awhile, otherwise you can go off course. So how do you make it more likely that you will actually do this, beginning today? By starting with the “Rule of 4s”. The “Rule of 4s” is a structured system for implementing the Keystone Habit. There is nothing magical about the number 4. I chose it because time is often socially divided into ~4 unit increments: 4–5 minute breaks are acceptable at work, 4 hours is as long as most people can productively work or study with full focus (up to 3 times a day), 5 work days/week, ~4 weeks/month, 4 quarters/year, 4 years for the average degree or job tenure. While 3 hours per week seems like a lot of time, remember this is broken up across 20 Keystones that average only averaging only 9 minutes. The 4-minute Keystones are also done during natural breaks (e.g. beginning, middle, and end of the workday), so they do not take much additional time. Only the Daily and Weekly Summary Keystones require 2 hours per week, but occur during nights and weekends when we have more freedom and flexibility. With these longer keystones, it is obviously not recommended to lock yourself in a room and write for hours or days at a time. Rather, the idea is that while you are taking time off anyway, periodically do your reflection and intention exercises and iterate on it over time. For example, for the Annual Summary Keynote over the holidays, on the first day, write your final quarterly Summary Keystone and re-read your 4 Quarterly Summary Keystones. On the second day, gather meaningful 360° feedback through conversations with family or friends. On the third day, do some deep reflection and write a draft of your Annual Summary Keynote, and on the fourth day, iterate on it until you feel you have a compelling plan for the year ahead. If you are a traditionalist, I recommend using simple alarms and a notebook to practice the Keystone Habit. If you are a techie, you can use goal-setting or project management software that assigns tasks with due times (e.g. Asana) to keep track of your Keystone Habit. I plan on working with a talented developer to develop a custom iOS app for the Keystone Habit, so if you are interested in trying it, enter your email in this form to be notified when it is released. It is important not to let the ideal get in the way of the practical. The ideal way of goal-setting is to have an idea about what your 4-year goals are, and then work backwards down to the next 4 hours. For example, if your 4-year goal is to finish a bachelor’s degree, that trickles down into an → annual goal → quarterly goal → monthly goal → weekly goal → daily goal → hourly goal: read chapters 1–3 of my biology textbook. There are two challenges with this approach. First, some people have no idea what their 4-year goals are, and that is fine for now. Second, it can be a little overwhelming to have to come up with them before starting this system, which can lead to procrastination and never starting in the first place. That is why I recommend simply starting with just a 4-minute Keystone Habit about what you want to accomplish in the next 4 hours. Not only is it S.M.A.R.T., it increases the odds that this article will be unlike most others and actually change your behavior. Along the way, if you come up with longer-term goals, then that is great — fill them in during future Keystone Habits. In a future article, I will explain a values-based approach to determining your goals (based on Acceptance and Commitment Therapy, which I train psychologists and psychiatrists to use). The great thing about the Keystone Habit is that it directly applies to and repairs itself as well. This is critical because the majority of such habits that are not intrinsically rewarding are never maintained long-term, because we either fail to start, forget to do them, or falter and never get back into the routine. So every time you practice the Keystone Habit, your first and permanent goal will be to do the Keystone Habit again after the next time block. That way, if you find yourself slipping by skipping a few Keystone Habits (even if for days or weeks at a time), that is totally fine and even expected. The important thing is to analyze why it happened once you start again, and come up with an action plan to do things differently next time around. Finally, I want to point out that the Keystone Habit does require a reasonable amount of effort. So why bother? Because there is nothing more tragic than letting life pass you by and failing to change with it. I had a conversation with a loved one recently who wrote their annual personal review and realized they actually became worse this year in their exercise, weight, and career progression. While I praised them for doing an annual review, I am also convinced that if they had instituted the Keystone Habit system to readjust their goals every 4 hours, they would have been able to avoid the backslide and get back on track much sooner. The irony of personal development is that most people do not institute best practices they already use in their professional development. Most great organizations engage in goal-setting and use periodic check-ins to evaluate progress and adjust goals. Similarly, great technology teams practice lean startup and agile methodologies, by experimenting simply and cheaply, learn quickly from successes and failures, and iterating on processes and products. For example, Toyota produces the most reliable cars in the world because it practiced the Japanese philosophy of Kaizen (continual improvement) to stop factory lines whenever a mistake was found, conducted an on-the-spot root cause analysis, and did not continue until it was fixed. Continual improvement is a tried-and-true approach for building great products and organizations, and is also fundamental to building great people. Great organizations provide natural structures for employees, so individuals need to apply a similar structure like the Keystone Habit in their own lives to make continual improvement practical. Bob Dylan eloquently said, “he who is not busy living is busy dying,” and I would contend that “he who is not busy growing is merely surviving.” This year, each of us has an amazing opportunity to not just survive the year ahead, but to truly thrive and develop into the person that we want to be. So before you close this window, if reading this inspired you in any way, please like this article and start practicing the Keystone Habit right now. Take a moment to reflect on how you have been doing today on your goals and write down what you want to do in the next 4 hours (below if you’re willing). I welcome your comments to provide your feedback/tweaks on the Keystone Habit, and hope that you will follow me for future articles that can inspire productivity and transform your life. Many thanks to Nicole Zeman, Serguei Filimonov, Benjamin Tseng, Michael Bjorgaard, R.J. Ellis, and Ella Chiang for their feedback on this post, and to Kerem Suer for the illustration design.